Many people in Hong Kong have no concept of how airlines developed in the territory despite air services being their primary means of transport overseas. Airline services arrived late in Hong Kong relative to the rest of the world. 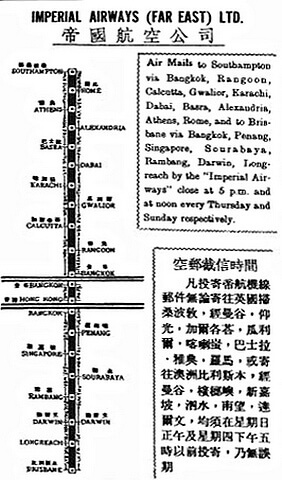 Not until 1936, when the UK based Imperial Airways was slowly extending its routes from London to countries in the ‘Empire.’ Weekly flights from Penang to Hong Kong were to link with established services between Australia and London. In the foyer of the preserved Croydon Airport terminal building in south London there is a large Imperial Airways poster showing its routes in the Far East branching off to pass through Hong Kong and then on to Shanghai. 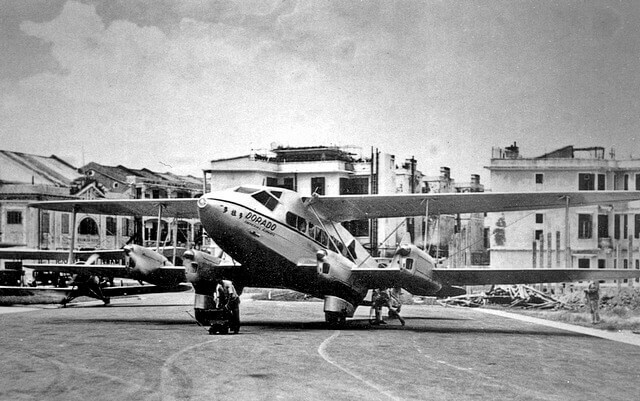 While the Paris of the East was never reached by Imperial Airways, the Hong Kong route became a vital link by joining the Pan American trans-Pacific route and Imperial Airways Singapore and London services so enabling passengers to travel on scheduled flights right around the world by air for the very first time. On 13 August 1935, Imperial Airways (Far East) Ltd was registered in Hong Kong and survey flights were instituted based at Penang to search for a route to Hong Kong 1,000 miles away on the rump of southern China and 7,500 miles from the airline’s base at Croydon. Captain William Armstrong and his crew set out from the UK on 16 September in a wood and fabric de Havilland DH-86 four-engine, 10 seat airliner, named Dorado, fitted with an extra fuel tank in the cabin. Their journey ended at Penang where they based themselves at the Runnymede Hotel. The British government preferred an ‘All Red’ route through territory under its influence. Royal Air Force flying boats had made a number of exploratory forays from Singapore through Borneo and up through the American controlled Philippine Islands to Hong Kong. The route chosen by Imperial Airways was shorter, requiring permission only from the French who had an ideal diversionary airfield at their enclave of Fort Bayard in southern China midway between Hanoi and Hong Kong. China’s land mass had to be skirted by flying offshore as foreign aircraft were notionally barred from Chinese territory for fear that the Japanese with whom they were in conflict would demand equal over-flying rights. Advice given by the French was to use Tourane or Hue in the north of Indo-China as stepping off points to Hong Kong. 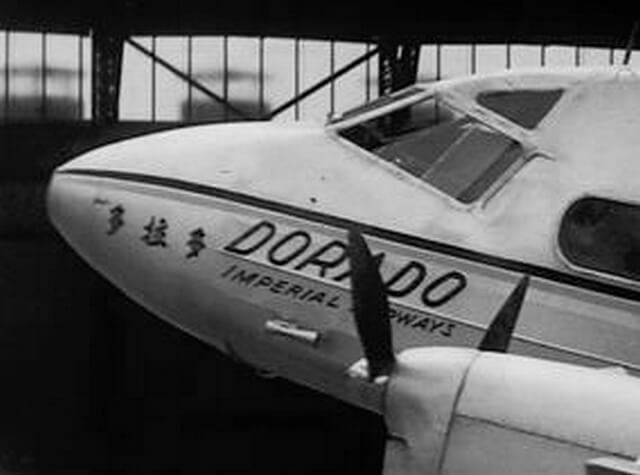 Arriving at Hong Kong, Dorado’s crew were met by the Director of Air Services and a large crowd of well-wishers who were very disappointed that no mail had been carried. This was the first British airliner to reach Hong Kong and over the next few months made a number of survey and simulated service flights. Although scheduled for two days, the crew found that the flights could be completed in 1 ½ days and in one day if they left Penang before dawn in ideal conditions. On November 29, the press were advised of a further ten simulated service flights and that Captain Lock would conduct them. All went quiet, then quite suddenly, the colony was told on 12 March 1936 that Maurice Curtis had arrived as Imperial’s local manager, an office had opened in the Peninsula Hotel, and also the fare schedule was announced. After six months of route testing and a lot of anticipation, Captain Lock brought Dorado into Hong Kong on 24 March with sixteen bags of mail and an unexpected passenger to inaugurate the first scheduled service. A large crowd greeted them headed by the Governor as the aircraft taxied into the hanger for an official reception. Meanwhile the passenger, Mr Ong Ee-Lim, a wealthy Malayan-Chinese businessman declared that the flight had been “very cold,” and that he had been sat on top of the mailbags all the way. Initially passengers were infrequent and their comings and goings were reported in the press which listed each arrival/departure time, the weight of mail and freight and passenger’s names and destinations. The carriage of mail was the primary criteria for these subsidised flights, and only if space was available were passengers conveyed. Mail loads grew rapidly and their timeliness became a major feature of business life where surface mails had previously taken weeks and months to reach a destination. A taste of aviation to come arrived in Hong Kong on 23 October with a modern trans-Pacific Martin M130 flying boat carrying the Pan American Airways chairman Juan Trippe, his wife and executives to inspect their CNAC airline interests in China. Trippe and his wife later left in Dorado for Penang and from there by the Imperial Airways A.W. Atalanta Aurora for Europe. From Germany, the couple crossed the Atlantic by Zeppelin airship to Brazil and then flying boats to New York, making them the first people to travel around the world entirely on civil air services. By its first anniversary in March 1937, the Imperial Airways service had completed 52 successful flights with 46 completed on schedule, four a day late and two, two days late. On 28 April, Pan American Airways started regular services to Hong Kong by extending its trans-Pacific route from Manila. This enabled ordinary passengers for the first time to travel all the way around the world by air on scheduled services. Japanese aggression on the Chinese mainland was moving ever closer to Hong Kong. For protection the DH-86s were emblazoned with Union Jack flags on the wings and fuselage. These did little to protect them as a number of shooting incidents culminated with the downing of Dardanus commanded by Captain Wilson on 8 November 1939 by Japanese pursuit aircraft forcing him to land on Japanese held Weichow Island near Hainan. Meanwhile, war in Europe had been declared. Imperial Airways, a commercial company, and British Airways, also a commercial company, were forcibly merged by the UK government to become the government controlled BOAC (British Overseas Airways Corporation) on 24 November 1939. The war in Europe had little initial effect on this local route, but with Indo-China under the control of the French pro-Vichy regime the situation in 1940 was in a continual state of flux. The more so when Japanese troops reached the border and demanded access and bases. Imperial/BOAC services continued carrying passengers and mail until 15 October when it was announced that they were to be permanently suspended as the Japanese progressed south throughout Indo-China. The DH-86s were withdrawn to Africa to join other remnants of the Imperial Airways/BOAC landplane fleet stranded away from the UK by the war in Europe. Despite many claims over the years, the Imperial Airways ‘Empire’ flying boats never operated services to Hong Kong, although BOAC’s Short S-33 flying boat Cleopatra did make a solitary visit in April 1941. It was carrying Air Chief Marshall Sir Robert Brooke-Popham and his staff for meetings on the colony’s military preparedness for possible conflict with Japanese troops operating along Hong Kong’s border. Hong Kong was not left entirely cut-off by air. Pan American Airways continued to operate shuttle flights to Manila, and the China National Aviation Corporation (CNAC) and Eurasia flew services under the cover of night and bad weather to and from areas of China not under Japanese control until they invaded on 8 December 1941. Hong Kong surrendered on Christmas Day 1941. This article was first posted on 27th October 2014.